Well it has certainly cooled down here in Adelaide. We made it through the run of 42 degree days without our air conditioner. The new one is being installed today. I must admit that the hot weather did make me feel very lazy and I have not done much in the way of craft for a few days now. 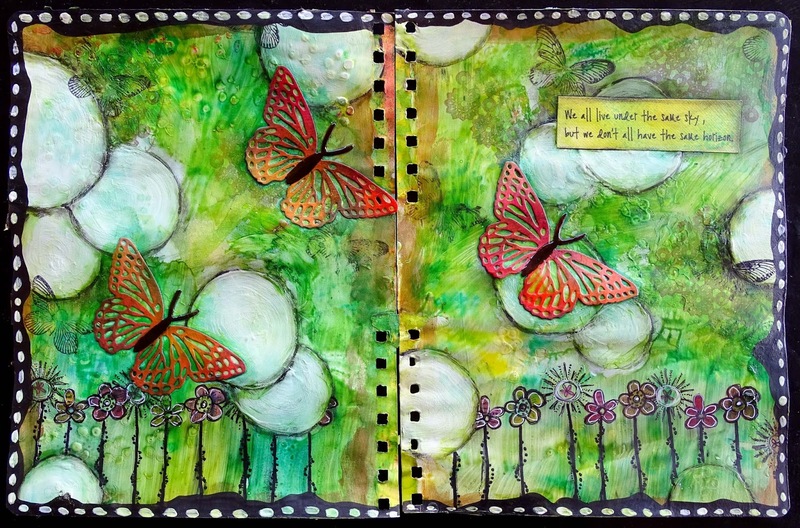 I did manage to finish this double art journal page so I would like to share it with you. The background is another one of those that were in my art journal from a class I had done previously and had never got around to doing anything with. 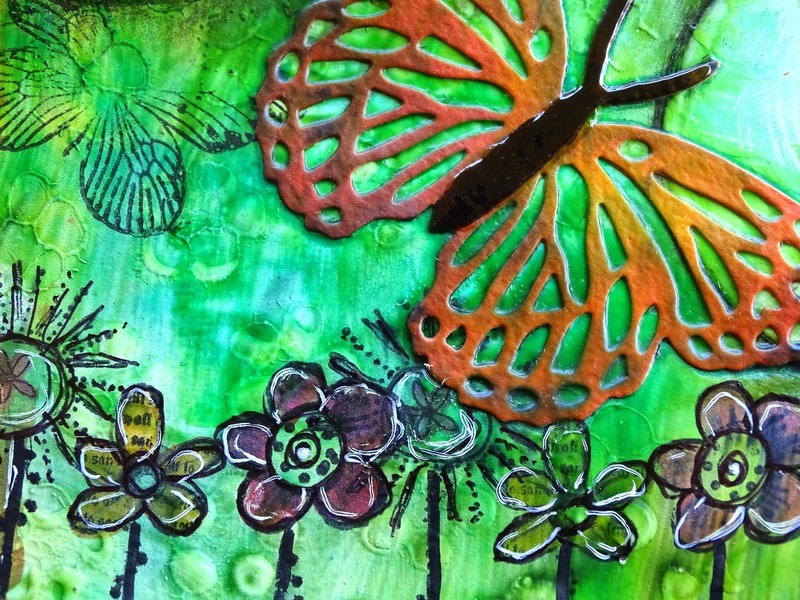 I used Dylusions Ink Spray in Fresh Lime and Lemon Zest and Docrafts Artiste Spritzing Ink in Mint to add some extra colour to the background as it was fairly pale. There is some texture paste through a stencil, stamping and Viva Inks Gold in the background. I drew the circles and then coloured them with Gesso. It took several coats of Gesso because the green kept leeching through. 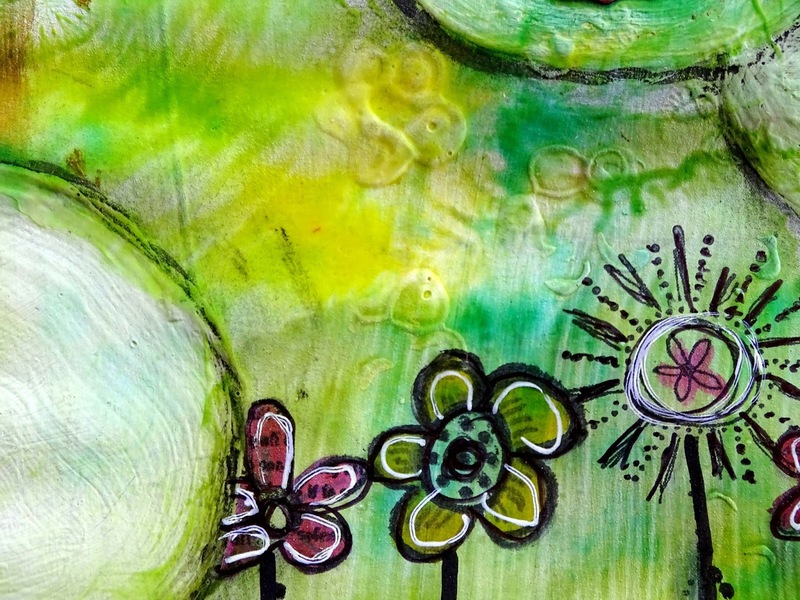 I used my Faber Castell Big Brush Markers to colour the stamped flowers along the bottom of the page and to shade around the circles. The title which reads "We all live under the same sky, but we don't all have the same horizon" was treated the same as the butterflies. Detailing was added using a black fine line marker and a white Signo pen. I then added a black and white border with my big brush markers and some white acrylic paint. 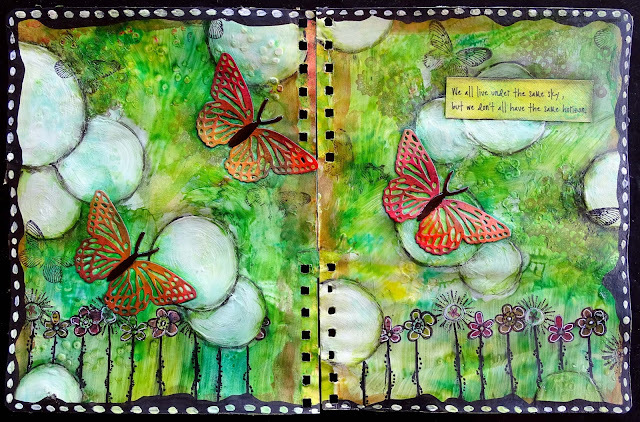 This is the first double page spread I have done, not sure if I will do any more. Love this page. So pretty.